I previously gloated (briefly) when Michigan won the first game in the NCAA Tournament, despite Obama’s prediction that Clemson would win. Tonight it didn’t do any good to root for my in-state rival. Obama got the big one right, predicting North Carolina’s ultimate victory in the tournament. North Carolina beat Michigan State 89-72. 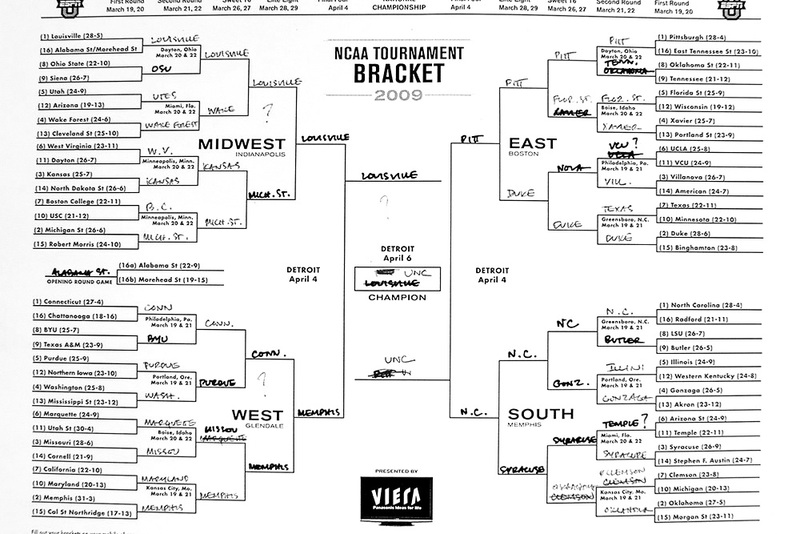 Obama had predicted that Louisville and not Michigan State would play North Carolina in the championship game. It’s a small thing but did Robert Gibbs really need to wake Obama at 4:30 am with news of the North Korean missile launch? We knew the launch was coming and Obama had no imminent decision to make. Waking the president to tell him things so he can return to a troubled sleep that leaves him less sharp the next morning strikes me as a PR-oriented tradition we can do without. Most likely they could have allowed Obama to sleep through this but were concerned about criticism if people thought that Obama was sleeping through a potential crisis. There is one danger with the idea that the president could have been allowed to sleep unless he had some decisions to make at the time. There is a considerable gray area where perhaps the president wouldn’t make a decision at the time but staffers might not know this until after they checked whether the president wanted to do anything. This deference to a very bad country has been going on for decades; it didn’t start with Barack Obama, or with George W. Bush, or with John F. Kennedy for that matter. Instead of impeaching Barack Obama, America needs to impeach its gas tanks. Update: I posted this primarily because I was amused when I received a link to Little Green Footballs defending Obama. It was sort of a “man bites dog” story, but (like all the recent stories along these lines) not of terribly much signficance. There is argument over in the comments at LGF as to whether Bush was only bending to accept a medal or whether he was also bowing down to Abdulla. I don’t think this is important enough to get involved in. Those who care to argue the issue can join the argument at LGF.